Kubrick's 1968 masterpiece 2001: A Space Odyssey rang in a new era for science fiction on the silver screen. And gave a young special effects master his first chance at directing. 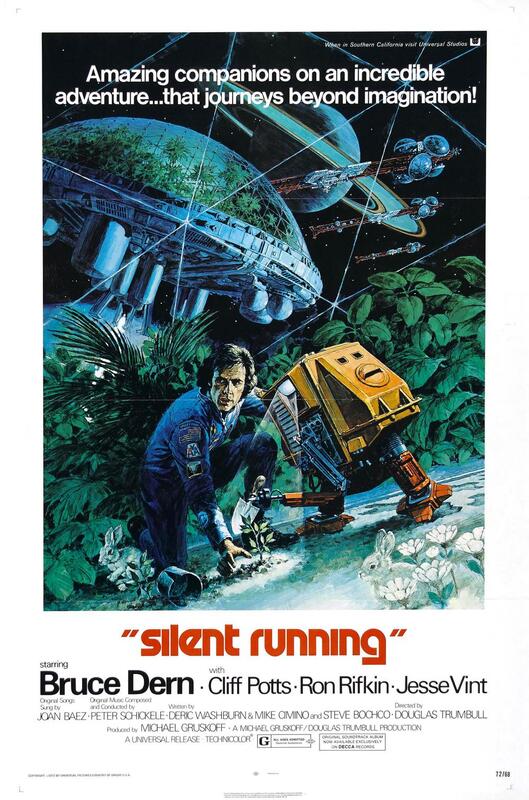 The original 1972 poster for Silent Running, but George Akimoto. Genres that had previously been concerned almost exclusively with the abduction of young women by hulking monsters and robots turned instead to more intellectual stories. John Carpenter's 1970 student film turned studio film Dark Star was one such film. Douglas Trumbull's 1972 classic, Silent Running, was another. Lucas never said as much, but I thought it was the artistic success of films like Planet of the Apes (1969), 2001: A Space Odyssey (1968), Dark Star (1970) and Silent Running (1972)—the mere fact that they could be done—that planted in Lucas the idea that the sophistication of effects techniques could indeed support the Flash Gordon-esque idea he had been toying with. Lucas's own THX 1138 was a shining beacon for intellectual science fiction, but it contained almost exclusively practical photography, which is to say that there had been no trickery in filming what appeared on screen; it had all been right there, in front of the camera. Lucas's salesmanship and new-found ambition in the wake of American Graffiti's succes caused him to swing for the fences and truly fight to bring a spectacle to the screen, not unlike what he himself had seen back in the mid-50s when Forbidden Planet first wowed a generation. That had been an outrageous film of massive ambition and scope, and amongst its many triumphs were Robbie the Robot, who much like Star Wars' own droids and Back to the Future's hoverboards, it would long be rumored, was in actual fact a fully functioning, real robot! What Trumbull managed to do under severe budget constraints with Silent Running, heavy-handed and sentimental though it may be, was to take that same sense of awe; the kind of 'how did they do it!?' wizardry that made people sit up and take notice, and use it to humanize the completely inhuman. That was something Lucas could get behind. Not only were the drones cute and relatable, but... well... how the hell were they done anyway? Douglas Trumbull had been hired by Stanley Kubrick to work on 2001's visual effects when he was just 23-years-old. There, under Kubrick's strict supervision, he developed the star gate sequence using a technique he invented for the purpose called slit-scan, which yielded some of the most unique imagery in a film already filled to the rim with amazing visuals. Imagery which in turn would be copied on the cheap by Dark Star a couple of years later, and a refined version of which would finally make its way into Star Wars as the effect for jumps to lightspeed. Trumbull had followed up 2001: A Space Odyssey with effects work on The Andromeda Strain (1971), and his success on that film in turn paved the way for a shot at directing his own science fiction film for Universal in 1972 from a treatment he himself had written. Universal were experimenting at the time with low-budget, word-of-mouth-only films, and Silent Running was (unbeknownst to Trumbull) one of those, with a budget of one measly million dollars; a tenth of 2001's, and a twelfth of Star Wars' eventual budget. Silent Running upends the cold austerity of 2001, with a sentimental story about the preciousness of life, natural or artificial. In it Freeman Lowell (Bruce Dern) commandeers a space freighter carrying geodesic domes of plant and animal life set to be destroyed. Lowell kills his cynical fellow crew members to rescue the cargo, and sets a heading away from Earth, accompanied only by three robot drones, Huey, Dewey and Louie. The drones play as central a role to the film as Dern's character, and are clear forerunners to R2-D2, even in-so-far that they had people inside of them, making them walk and driving their manipulator arms. The idea for the two bickering droids had come originally from Akira Kurosawa's Hidden Fortress, although in an attempt to turn the world on its head, and induce the sensation of something truly alien, the peasants had been turned into robots in Star Wars. "For R2 I was looking for something different from the little robots that were done for Silent Running, that Doug Trumbull had done. They were square, and I knew that our robots would be compared to their robots; because George had talked about that, you know. He said, 'well, you know the little robots in Silent Running? ', he wanted a little worker robot like that for R2-D2. And I thought, well, I'll make him, instead of a box, I'll make him a can, you know, a cylinder with a dome on top. That was my first thought, just strictly in the sense that I didn't want him to look like Silent Running almost. They had two legs, so I thought, 'I'll give R2 three legs'. The first one I did, I think he had a spherical bottom, like a ball bearing that would roll around; he had gyroscopes in him, so he didn't fall over, and he just leaned in whatever direction he wanted to do, and spun his single wheel, which is really a sphere. Which sounded pretty interesting, but very difficult to do in reality. And I put little pedals on him and places for arms to come out, I knew he had a lot of little gadgets that, he was kind of like a swiss army knife, you know. And he had to have lights, and he had to have lenses to see through. He had to have color, to distinguish him from another robot, so I found places to put blues. "Instead of two legs, I gave Artoo three legs, figuring he'd throw himself forward like a person on crutches. That would be the way he would walk." The final result, the first production painting finished for Star Wars, was the birth of a classic silver screen pairing, and an instant McQuarrie classic. And with two of the main characters starting to come into focus, the movie's visual style started truly taking shape. "Artoo and Threepio leave the pod in the desert." was the first production painting finished for Star Wars by Ralph McQuarrie. In all likelihood, the three-foot stilt-walk probably turned out to be too hard to pull off, and R2 finally got his roller-skate feet. 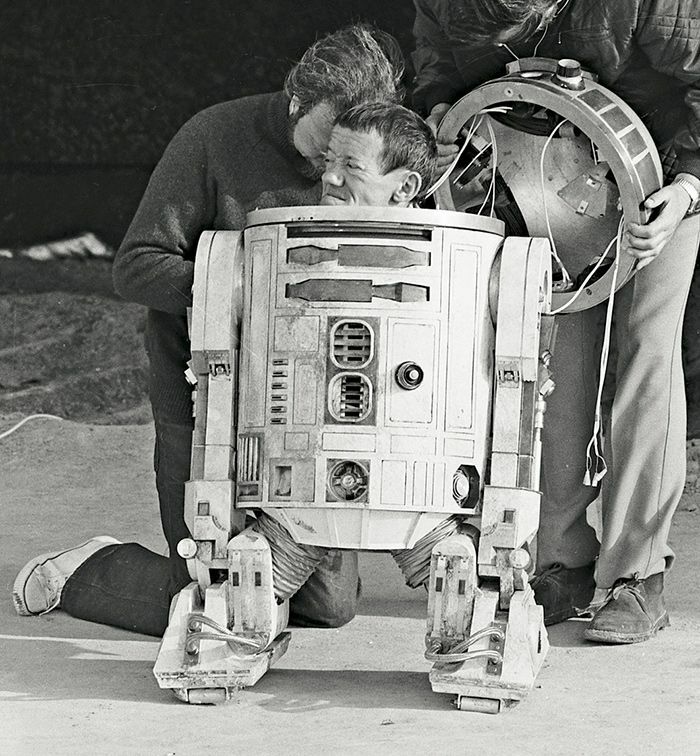 Originating in the Silent Running drones, populated as they were by people, meant that R2-D2, which often carried Kenny Baker inside, could spring to life in ways a remote-controlled droid wouldn't have been able to. R2's awkward, but endearing side-to-side wobble, an inheritance from Trumbull's drones, would be one of the very things that humanizes R2 as a character. Solving these problems was a very real concern for the production. Artisans skilled in the esoteric crafts of special and visual effects were not commonplace in the 1970s (Lucas had to build his own effects house to even get the film off the ground), and Lucas looked far and wide in assembling his crew. Indeed Lucas managed to get people from most of the genre films of that period, including crew from 2001 and Dark Star. Naturally he also approached Douglas Trumbull. After all, here was a film maker who had managed not only to make what was obviously a very personal film, but to do so with a very limited budget, using shoe-string techniques; something Lucas could relate to. "Shortly after I did Silent Running, I was approached by George Lucas to do effects for Star Wars, which I gracefully declined, because I was directing. No more doing contract effects for people, but I said: 'George, I'd be happy to give you the names of all our people who worked on the drones', and he said, it kind of made him nervous. He'd rather use midgets or somebody different. So R2-D2 really came from Silent Running." The Making of Star Wars (iBooks edition), J.W. Rinzler. Star Wars: The Blueprints, J.W. Rinzler. Epic Ink Books (2011). Douglas Trumbull interview on Mark Kermode and Simon Mayo's Film Reviews podcast (November 11, 2011).